Hello Beauties! I hope you've all had a lovely week! I've spoken plenty of times about my acne here on Lipgloss & Lashes (here, here and here) so I'm sure it comes as no surprise to you that I was pleased to hear that bareMinerals had released a brand new foundation, targeted at acne prone skin. 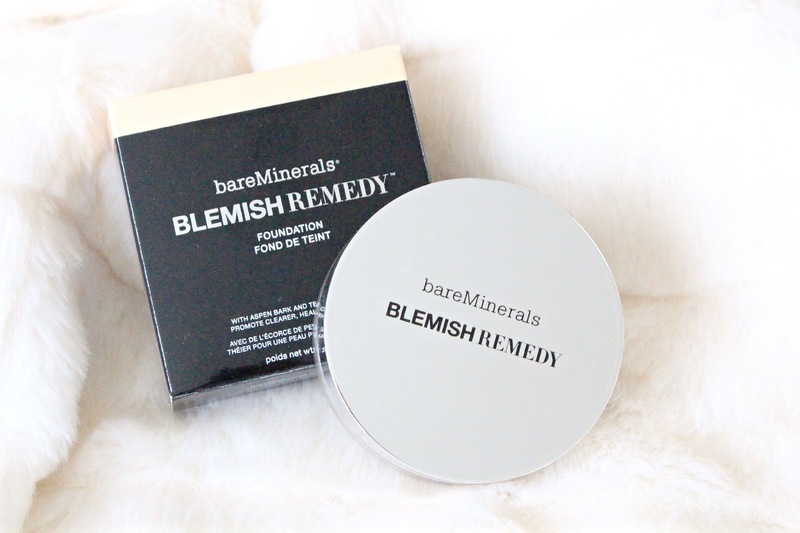 bareMinerals Blemish Ready Acne-Clearing Foundation is a light weight mineral foundation that helps to treat blemishes and redness. It's formulated to prevent new blemishes from forming while it treats blemishes you already have, with a mix of minerals and salicylic acid. The lightweight formula promises a non-drying finish that blends easily and creates natural looking coverage. The first thing that struck me about this foundation was actually the coverage it provided. 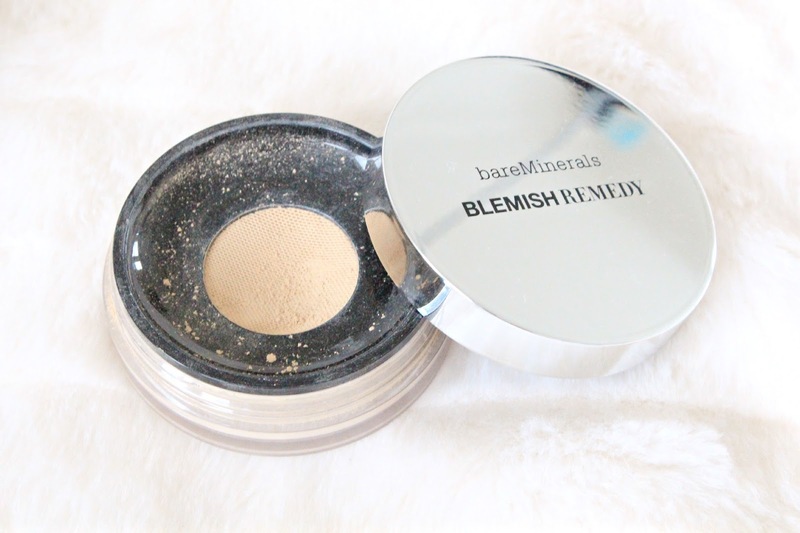 I've not tried many mineral powder foundations before, so I have nothing to compare it to, but the coverage was just so light, which I found odd for a foundation targeted at those with blemish prone skin. When you're suffering with breakouts or if you've suffered with acne in the past which has left you with scarring and an uneven skin tone, you definitely want that covered and concealed, and this foundation just didn't offer that. I did manage to build the foundation up slightly so it offered more of a medium coverage, however it took me about three layers to do this and a lot of time blending it all in, and even then you could still see some of my blackheads and scarring (TMI but it needed to be said). If you're someone who prefers the more natural look, then you'd probably love this, however if you're more of a full coverage gal like myself, then you'd probably want something a little more heavy duty. Coverage aside though, I actually really liked the finish of this foundation. I expected it to look quite dry and cakey, however it blended in really nicely and left me with more of a satin-matte finish. It was still matte, but it had a slight glow about it...just enough to make you look nice and healthy without being dewy or shiny. Although, I'd say if you have particularly dry skin then this ones probably not for you, as it did highlight some of the drier areas of my face. One thing I really did like about this foundation was how light weight it felt on my skin. I'm used to thicker, full coverage foundations which you can definitely feel sitting on your skin, however this one felt completely weightless...to the point where I forgot I was even wearing foundation. The lasting powder did let it down slightly though. I have extremely oily skin (not even the most long lasting of foundations stand a chance) so I kind of expect it to go fairly oily, nothing new there, but it might be worth just bearing in mind if you have similarly oily skin. As for it's acne-clearing promises, I have to say I'm actually slightly impressed. I never really expect much from these acne-clearing/preventing makeup lines, however I did notice that this foundation helped to dry up any of my existing spots, and I noticed that I was developing less of those nasty under-the-skin spots that I'm fairly prone to. I'm not sure if it's the foundation on its own that helped with that, however it certainly had a role to play. Overall, I have mixed opinions of this foundation. I really liked the finish and how light weight the foundation was, but unfortunately it just didn't offer anywhere near enough coverage for my liking. I will still use this foundation for days when I want a more subtle look or 'no makeup makeup' days, but it's probably not something I will repurchase...which is a shame, as I normally adore bareMinerals products. My skin is so annoying, this foundation just sounds perfect for helping it out! The idea behind this is absolutely fabulous. I love that BM put out a product like this! It is a shame that your experience was not a totally amazing one but fingers crossed you can still get lots of use out of it. Interesting. I can see why you have mixed opinions, like you said, if I have scarring etc you probably want that covered up. I will check it out though, I never tried mineral makeup before! Such a shame about the coverage issue of this because the formula sounds like it could be quite interesting. If you're looking for a mineral foundation, I recommend the Inika one. It's a medium coverage and works beautifully at covering up blemishes and scaring! This sounds fab but its a shame about the coverage, because it's pretty tricky to use conceal on top of a powder foundation!